Blue Raincoat’s new production of “Alice In Wonderland” opened last night, Wednesday, October 26 and continues until Saturday, November 5. 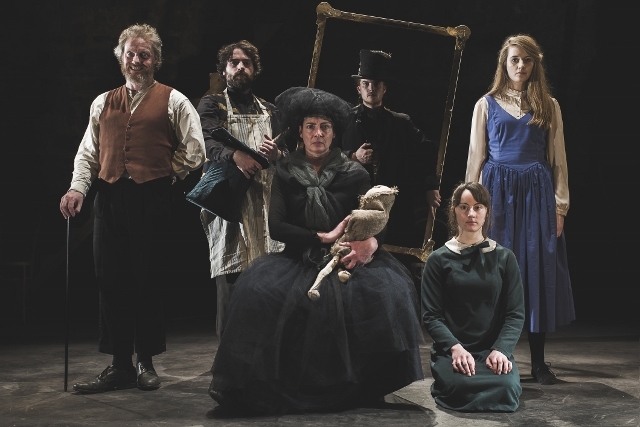 This is not the first time the company has performed Jocelyn Clarke’s adaptation of Lewis Carroll’s classic children’s tale, but with the passing of time (15 years or so) comes a new and young crew, peppered with a couple of very well-known Blue Raincoat stalwarts. One of those, playing a bewhiskered and creepily smiling Cheshire Cat, is John Carty. He was involved in the original production a decade ago and admits that his role in this play is definitely showing his years. This production is very different to the previous one. The actors, under the direction of Blue Raincoat founder Niall Henry, have reinterpreted the story and brought their own touches to it. So with a largely new cast comes a very different story. “The physicality of this show is very different. It is hard to describe how. The first one was more of a spectacle. This one is more pointed. That’s not strictly true as two of the young cast members, Barry Cullen and Brian Devaney, have starred in more than one previous Blue Raincoat production, but they are not the veteran members that John and Sandra are, both being the youthful side of 30. Fellow bright young thing, Hilary Bowen-Walsh boasts an impressive resume which includes the National Youth Theatre, but the youngest and least experienced cast member, Mirian Needham, has the starring role, as Alice herself. “What they [the young cast] bring to is is energy, enthusiasm and vitality,” enthuses John. So, 15 years on, is there a sense of deja-vu to this production? “Alice In Wonderland” will be performed in the Factory Performance Space in Lower Quay Street up to November 5 (excluding Sundays and Mondays) at 8pm nightly. Tickets cost €18 (€15 concession) with a two-for-one offer on Thursdays (October 27 and November 3) and a post-show talk from cast and director on Wednesday, November 2.